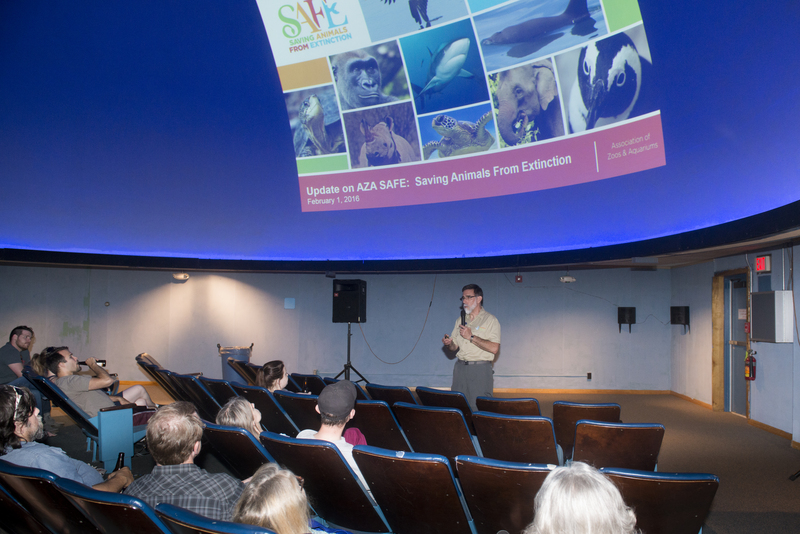 John Chapo, president and CEO of the Lincoln Children's Zoo, speaks during a Science Cafe program at Morrill Hall in June 2016. The series allows adults 21 and older to explore science and natural history topics in a casual environment. The University of Nebraska State Museum's Science Cafe series will explore music, ice skating, and research in the Galapagos from January through March. The programs, for adults 21 and older, are 6:30 to 8 p.m. the third Thursday of most months. Jan. 19: "The Relationship Between Music and Math" with Barbara Zach, executive director of Lincoln's Symphony Orchestra, Morrill Hall, 645 N. 14th St.
Feb. 16: "Physics of Ice Skating" with Andrew Vikartofsky and Karl Ahrendsen, University of Nebraska-Lincoln Department of Physics and Astronomy, Boiler Brewing Company, 129 N. 10th St.
March 16: "From Nebraska to the Galapagos: New Discoveries by UNSM Researchers" with museum curators Robert Zink and Scott Gardner, Morrill Hall. Science Cafe is a casual, educational and entertaining series that allows adults to explore a variety of science and natural history topics. Each month, attendees can enjoy food from Raising Cane's or Greta's Gourmet Catering while hearing from scientists and researchers. Attendees can ask questions and offer opinions in this informal setting. Tickets are on sale here. Admission is $10 for museum members and Nebraska students, faculty and staff; and $15 for non-members. Admission includes one drink ticket, three Raising Cane's chicken fingers, toast and Cane's Sauce. A vegetarian meal option is available. Seating is limited. A cash bar is available. Ticket sales end at 10 a.m. the day of the program.